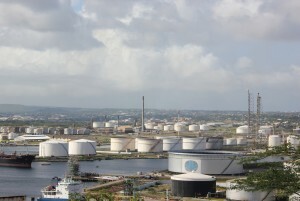 WILLEMSTAD - The hundred-year-old oil refinery in Curaҫao is one of the most complex cases in terms of its corporate governance, relationship with the public, and its NGO status. The plant is owned by the state-owned company RdK and is leased to the Venezuelan state-owned company PDVSA. The contract will expire in 2019, which is less than one year from now. A task force has been appointed to seek a new partner to run the refinery and difficult negations are taking place with GZE, a state-owned company from China. The task force has been appointed by the shareholder of the RdK, the government of Curaҫao. When the ministers speak, they do this in their capacity as the representatives of the shareholders. Given the fact that RdK is a state-owned company and that the oil sector is still one of the most important pillars of the economy, the parliament and all political parties, as well as the press and other interested parties all get involved. Taking this into account, it is a miracle that mayoral mistakes have not yet been made. Also, it is no wonder that prime minister Rhuggenaath stated that he prefers a structure with no task force and the RdK with a leading role in the process of seeking a partner to continue running the refinery after 2019. Much more can be said about this and other elements of the corporate governance cycle. We invite you to attend our next Masterclass on Corporate Governance 3.0 on February 22nd and 23rd 2018. For more information, please visit www.universityofgovernance.com or www.miguelgoede.com.